As a leading British manufacturer of fires and fireplaces, Be Modern is delighted to launch a new electric suite to their contracts range. Introducing the eagerly anticipated Matlock electric suite; available 3 size options, choose Natural Oak with Marfil Cream or Black back panel and hearth or Warm Oak with Marfil Cream. This contemporary styled suite is complete with a new Bayden Classic inset electric fire. 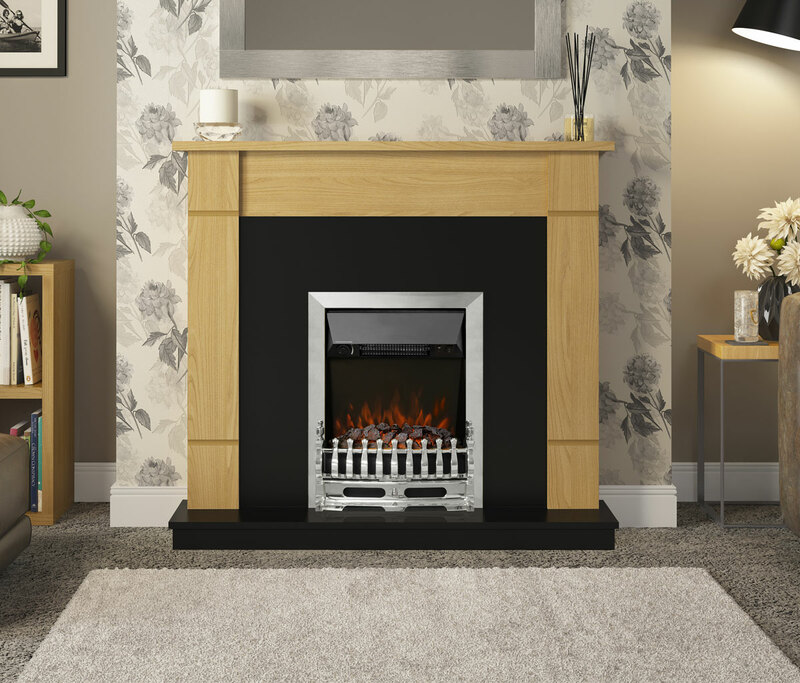 The Bayden fire included is available in a Classic design, in either Brass or Chrome finish; both fire options come with easy reach manual controls under the canopy of the fire, whilst the Classic fire is also available with the option of top side mantel mounted controls and a 7 day programmable remote control. Innovatively designed, the Matlock delights with a superb flame effect and utilises the latest LED technology for long life and low energy consumption. The Matlock offers an adaptable heat output of 1kW and 2kW heat settings and flame effect only setting allowing the realistic flames to be enjoyed in any season. This one box product requires no assembly and can be fixed flat to any wall – incredible simplicity. Be Modern commented: “We are pleased to add the Matlock to our Contract Solutions collection. The choice of fire allows for a truly custom centrepiece whilst also adding a stylish finish to any surrounding”.